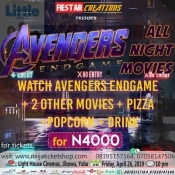 On April 26th, Avengers and Marvel fans will be welcoming Avengers: End game to the cinema, be among the first to experience the new Marvel Studios blockbuster plus 2 other movies at the Exclusive Avengers Movie Night (An all-night cinema experience). Happening on the 26th of April at Light House Cinemas, Yaba, Lagos. 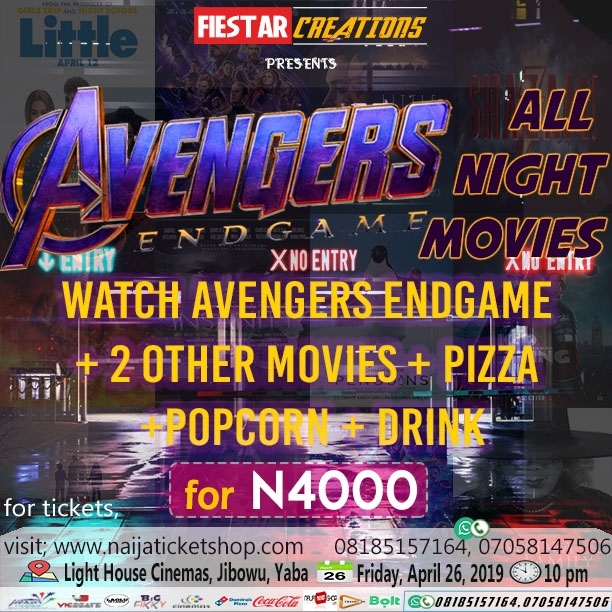 Not only Avengers, but our guests will also be watching two other top and trending movies, all for a fee of N4000, guests attending will be given a box of pizza, popcorn and drink to enjoy while enjoying the movies.📷. It promises to be an interesting night full of fun, suspense and action and music. The Venue, Light House Cinemas, Jibowu, Yaba, a 5 Star Cinema Theater with High Definition Screens located in the heart of Yaba, shielded from the bustle of Yaba community, providing quality cinema experience and hospitality services with impeccable customer friendly facilities such as Underground Car Park, Lounge, Snooker Table, Video Game Center and so on.